When Able Seaman Mark Daniels's foot hits the ground, a few things happen. A microprocessor-controlled knee kicks into action, adapting to the terrain. A carbon fibre-titanium foot absorbs energy and returns it, so he can go from standing to a sprint. An above-knee amputee after a motorbike accident, he is about to participate in the Invictus Games in Sydney for the first time. It's a week of camaraderie and athletic prowess, but according to Able Seaman Daniels, it's also a chance to compare the latest high-tech prosthetics from around the world — prosthetics that, thanks to a combination of computing, engineering and medicine, are increasingly sophisticated. "People look at you as disabled. We're not," he said. "The prosthetic and the wheelchair — they're our freedom. That's the way we're able to do these amazing feats. It's because we have the technology that allows us to do that." Far from one-size-fits-all, many prosthetics now come with inbuilt computing and use high-tech materials. Corporal Sonya Newman will be representing Australia for the second time at the Invictus Games. After an above-knee amputation following surgical complications, she now uses an Össur Rheo Knee XC with an inbuilt microprocessor, although she swims without it. Microprocessors placed in the joints of a prosthesis can better replicate anatomical movement, said Jim Lavranos, senior clinician at Caulfield Hospital prosthetics department. It can help make the knee or foot more stiff or less stiff, for example, to adapt to different speeds or slopes. With the addition of a motor, it can also open and close hands or flex elbows. Sarah Mulroy, clinical specialist with prosthetics manufacturer Össur, said Ms Newman's limb uses "magnetorheological fluid" in the knee — a smart fluid that creates different resistances to adapt to users' varying walking patterns. Able Seaman Daniels, who stays up to date on advances in the field, hopes there will soon be additional ways of controlling his prosthetic. "To be able to bend my knee by thinking about it, and be able to move my ankle." Externally powered prosthetics for upper-limb amputees, for example, need a trigger — something to activate the opening and closing of the hand, or the flexing and extending of the elbow. Traditionally, surface electrodes on the skin might be used. Sensors in the socket encasing the residual limb pick up signals from the muscles and use them as triggers to activate the hand. 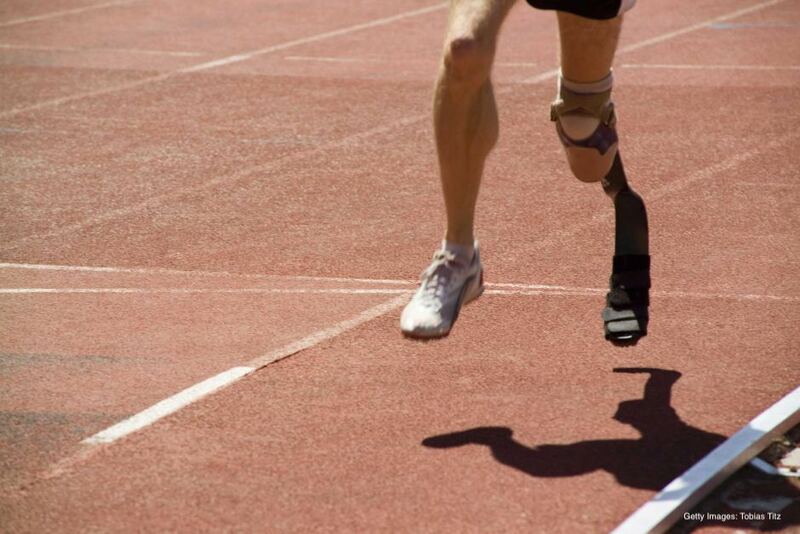 More recently, a concept called targeted muscle reinnervation is being applied with some amputees. Nerves are recovered from an injury or leftover nerves are used and reattached within the limb to different muscles to add multiple sites of control. "The prosthesis can pick up patterns and actually learn from what is intuitive to the amputee to use, as opposed to trying to train the amputee to use the prosthesis," Dr Lavranos said. Sometimes, the needs of amputees are simpler. If she could change one thing about her prosthetic, Corporal Newman said, she'd change how the socket fits. Her leg is attached by suction, and is quite simple to take on and off. Still, the humidity in Darwin causes some dramas. "I have a skin breakdown on the end of my stumps, so, unfortunately, that means I can't wear my leg for a couple of days until that heals," she said. New materials have a role to play in ensuring function and comfort. The quality of the silicon will affect how the residual limb feels in the socket, for instance. Emerging methods such as osseointegration, where the prosthesis is directly connected through the bone by an implant, still have drawbacks such as the potential for infection. Of course, this technology is not always readily accessible for everyone. The use of prosthetics by Invictus Games competitors, active service people and veterans, is in many ways the result of geopolitical cause and effect. The global armed forces have been integral to the development of advanced prosthetics, especially amid the conflicts in Afghanistan and Iraq. In some cases, microprocessor knees and hands were specifically designed to help injured servicemen and women. "I think when very strong and very dextrous, very able soldiers returned from the war … having expectations of prostheses that can then keep up with what they used to do, [it] drove the industry to really push for designs that tried to mimic normal human activity at every level," Dr Lavranos said. But of course, it's not the prosthetics alone that make the Invictus Games special for Corporal Newman. While she is starting to hate the word "inspirational", it still applies here. "We're not doing anything special, we're just trying to survive, trying to do something to keep us alive and give us purpose, and we've found that in sport," she said. "And most of it is, even just through the training, through giving yourself a goal to train every day, the reason they get out of bed and a reason to keep pushing."